See? I couldn't just post the punch-line could I? T'wod be flat out rude. 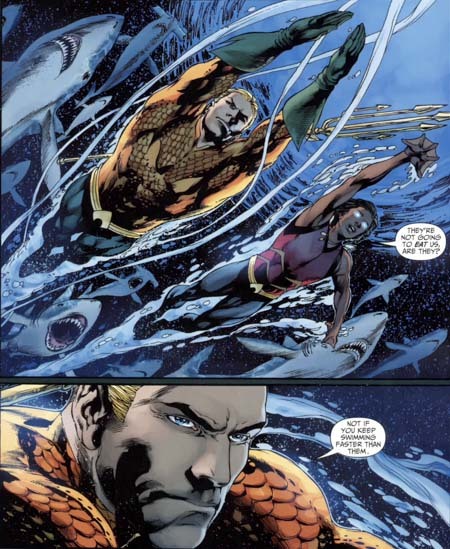 He may not be Plastic Man of the seven seas, but I love that Aquaman is getting his funny-bone back - well depending on how that cliff-hanger turns out that is! On a side note, I'm thinking that Aquawar logo could make a great Aquaman masthead! If you've been watching Brightest Day from the sidelines, now is a great time to dip your toes in the pool. All the plots are adding up and the books getting juicer each fortnight. Brightest Day #19 out now. He should take better care of his hands... Tsc.